What goes up must come down. It’s a scientific principle governing the physical universe, and it’s also one that applies to the Nielsen universe. 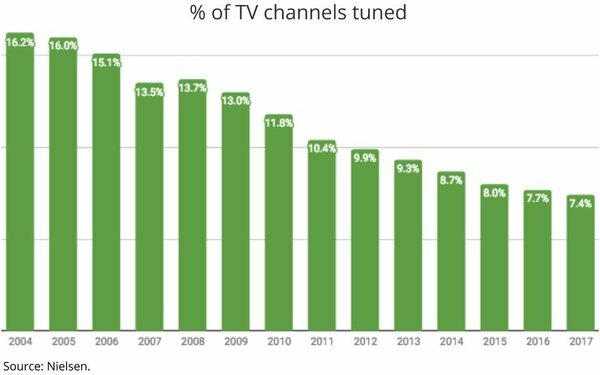 As the number of TV channels available to the average U.S. household continues to rise, the percentage viewed continues to decline -- falling to about 7%, according to the most recent estimates from Nielsen. 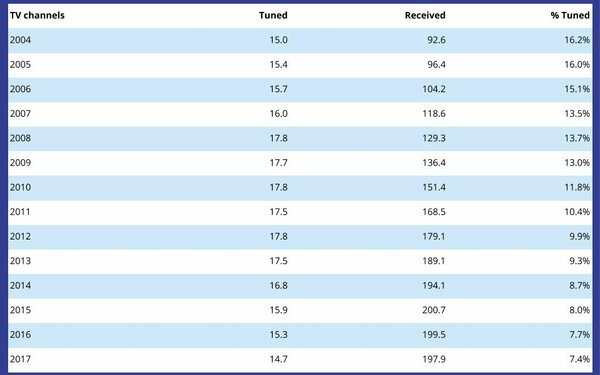 In 2017, the last year for which Nielsen has data available, U.S. TV households tuned to an average of 14.7 of 197.9 channels that were available to them, or just 7.4%. The number reflects the linear TV channel universe, but if over-the-top, subscription video-on-demand (SVOD) and other digital channels could be factored in, the percentage the average American household “tunes” to vs. what they can receive is likely even smaller. It’s an embarrassment of riches for consumers and programmers alike, because the ever-expanding constellations of choice are effectively eroding the mass reach of America’s most powerful mass medium.